1.2 Step 1: IDENTIFY YOUR INVESTMENT GOALS: WHAT DO YOU WANT? 1.4.4 Pricing: How do I know if I am getting a good deal? 1.4.6 Where to keep it? 1.5 Step 3: DETERMINE WHAT TYPE YOU NEED & WHEN YOU SHOULD BUY. 1.5.1 What Should You Invest In? 1.5.2 What percentage of your portfolio should be invested in precious metals? 1.5.3 When Should You Buy? 1.6.1 What do I need to do first? 1.6.2 We are ready to help. Gold, silver, platinum, and palladium represent the four industry-standard precious metals for investing and hedging. Their rarity, along with the industrial demand for these metals, has created a market for investors to purchase and hold precious metals in their portfolios as a store of value. For centuries, precious metals have been used amongst various cultures and civilizations as currency, symbols of wealth, prestige, and social status. They have a long-standing history of being associated with power, opulence, and financial security. Throughout history, precious metals have also been utilized as a store of wealth. They are tangible, recognizable, and liquid worldwide. Paper currencies can be manipulated, destroyed, and corrupted. Across the centuries and throughout our history, one fact has been proven true time and time again: Whether you were living in the fertile crescent or in the present day, technologically advanced world, precious metals have been and will remain a valuable commodity. In fact, precious metals have been around longer than any other medium of investment—withstanding the test of time, and making them the number one secure, safe and economic-upheaval-proof method for building and preserving wealth. The key to preserving and protecting your assets is an investment strategy built on smart portfolio diversification which includes a percentage invested in precious metals. But for investors new to precious metals, there can be a lot of questions. The most important of which being: How do you start? If you’re ready to begin your precious metals investment journey, then consider the following information your crash course in everything you need to know about getting started—complete with 4 Essential Steps for Investing in Precious Metals the Smart Way. Step 1: IDENTIFY YOUR INVESTMENT GOALS: WHAT DO YOU WANT? In order to know where you’re going, you have to know what you want. Identifying your investment goals is essential when putting together a precious metals portfolio. Different metals and products will offer different strategic benefits. Finding the ones that best suit your financial goals is key. What is your bigger vision?—What do you want to get from or with your investments (for your life, your retirement, your finances, your stability, your opportunities, your hobbies, etc.)? List as many things that come to mind. Why do you have this vision?—What is really the driving force behind your vision(s)? (i.e. “I value investing in my kid’s future;” “I want to pay it forward to a cause I am passionate about;” “I value security and want my retirement assets to be safe;” “I want to leave a legacy;” “I don’t want to turn out financially insecure like my father;” “I want to be debt free;” etc.). For each of your visions—identify the underlying motivation behind it. Lastly, what are your goals?—the short-term action steps or things you think you need to do (today) in order to get “there” (closer to your vision)? i.e. “Saving 10% of your earnings specifically for investing;” “Stop spending money on trivial things that take you away from long-term success”—(cutting back on multiple vacations, downsizing your car, cutting out unnecessary monthly expenses); organizing your ‘books,’ etc. These investment insights will help you paint a clearer picture for the rest of our steps, and solidify your personal leverage for making and sticking with an investment plan that’s right for you. Mutual funds and exchange-traded funds (ETFs) backed by bullion, mining company portfolios and other metals industry exposure. Physical Assets – Precious metals include gold, silver, platinum, and palladium, with the two most popular investment metals being gold and silver. You can purchase these as tangible metal assets in the form of bars, jewelry, coins and collectibles. Futures Contracts – A legally binding agreement for delivery of gold or silver in the future at an agreed-upon price. Mutual Funds – Professionally handled monies, pooled together with other investors, to purchase a group of stocks, bonds or other securities. Investors in mutual funds own the shares of funds—not the actual securities in which they invested. Exchange-Traded Funds – Also known as the “stock market” for precious metal investing. ETFs trade similarly to a stock on the stock exchange. ETFs are funds that own underlying assets, such as stocks, bonds, gold bullion and foreign currency, dividing ownership of those assets into shares. Shareholders having investments in these assets are guaranteed some of the profits made in interest or dividends that are paid out. Of the three fund types, ETFs have the most fluidity because they depend on how much is bought and sold throughout the day. (Note: You don’t physically own metals). “Gold” IRA – An Individual Retirement Account in which physical gold or other precious metals are held in custody for the benefit of the IRA account holder. This account functions the same as a regular IRA, only instead of holding paper assets, it holds physical bullion coins or bars. Physical assets (gold or silver metals) are typically the first step for getting started in investing before additional methods are pursued. Gold is the most popular metal, followed by silver, platinum, and palladium — and each has unique advantages for building a well-rounded portfolio. (Find out more at Investing in Gold and Investing in Silver). Bars or coins, and are most commonly referred to as “bullion” bars or coins (unless you have a collectible, rare edition coin—known as numismatic or semi-numismatic coins). Bullion bars are typically what you may think of from a James Bond movie—bars of metals that range anywhere from 1 to 32 ounces. These large bars are an efficient way to buy large quantities of physical gold, particularly if you plan to store your bullion investment in a precious metals storage facility. Bullion coins, on the other hand, are “lighter weight” and legal tender, generally allowing more flexibility for future trading. Lastly, numismatic and semi-numismatic coins are considered collectibles and are not produced in modern times. These coins are valued primarily for their rarity and condition. In fact, numismatic and semi-numismatic coins are generally worth more than their metal content. Pricing: How do I know if I am getting a good deal? Scammers and inflated metal dealers run rampant. It’s vital to keep up with market charts to have a pulse on current values, as well as work with a Precious Metal Advisor who can ensure you get a good deal and do not get misled. Spot Price – The paper market price of gold or other precious metals. It fluctuates from minute-to-minute, like any other commodity traded in the market. Spot gold prices are quoted as the price of 1 troy ounce of .999 percent fine gold deliverable in the paper market. Premium – The percentage of the additional cost of any precious metal above the spot price.The premium accounts for outside costs of doing business, including fabrication, distribution, brokerage fees, and perhaps additional collectible, or numismatic, values for rare items. Spread – The difference between the bid price (what the dealer will pay for it) and the purchase price. It incorporates the cost of fabrication, wholesale premiums, and brokerage fees as well. The spread can be more significant than the premium. ICA offers competitive prices and fully discloses all service fees and spreads. Your choice of storage will depend on a number of factors including your strategy, desire fo diversification, purchase plan, and risk-tolerance. At ICA, we have a comprehensive and unique Precious Metals Storage Program which you can learn about here. Step 3: DETERMINE WHAT TYPE YOU NEED & WHEN YOU SHOULD BUY. Now that you have a few of the basics down, you’ll want to determine WHAT you should buy and WHEN you should buy it. Here at ICA we recommend investing in physical gold, and physical silver to diversify your portfolio. We also recommend physical platinum and palladium coins and bars. There is a time-tested strategy able to increase your precious metals position without additional funding. The strategy is based on the fact that the relative values of gold, silver, platinum, and palladium fluctuate over time, in relation to each other. 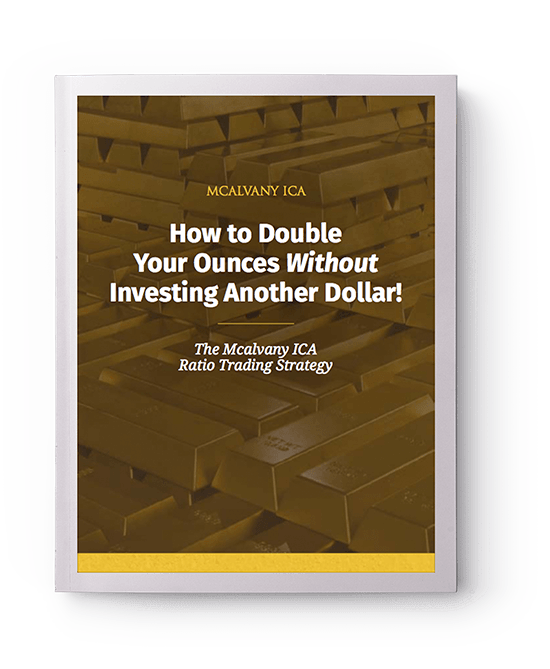 The experienced advisors at ICA have been helping their clients execute these ratio trades for decades, increasing their client’s ounces and portfolio value through strategic timing and expertise. We pioneered the strategy. What percentage of your portfolio should be invested in precious metals? This specific percentage will depend on your personal investment goals. As a very basic guidepost, we recommend allocating at least one-third of your investment funds towards precious metals, which includes IRA diversification. The most attractive time to buy is when the market is looking “up,” but that does not always make the best time to buy. Don’t get caught up in the hurried frenzy of a bull market. Remember; the primary reason to own physical metals is not to make a quick profit, but to maintain a long-term store of wealth and value. That being said, your ICA advisor can inform you of optimal entry points. Now that you have an idea of what you want, as well as a basic understanding of terminology, you’re ready to talk the talk—with someone who can properly guide you towards the best decision for YOU. Unlike traditional brokers and dealers (or Google searches), ICA’s unique Precious Metal Advisors offer a customized and personalized investment experience and education throughout the entire investment process —answering all of your questions, helping you reach (and clarify) your goals, advising you on progress, opportunities, and managing your investment portfolio. When you call on the phone or step into our offices at ICA, a Precious Metals Advisor meets you where you are in your information gathering, and welcomes you to a gold and silver investment educational experience. Your advisor will take the time to get to know you and your investment goals, and will work hard to build an investment blueprint aligned with your goals, values and comfort level. At ICA we care about relationship above all else and ensuring that our clients’ goals are met. With over 45 years of experience, we offer our clients integrity and wisdom in our recommendations and portfolio management strategies. A precious metal advisor helps guide, teach, counsel and support you every step of the way—a resource to finding the best investments that fit your needs, as well as helping you continue to preserve your assets, while saving you time, money (and headaches) in the long run.